Viget designers use a Campfire room to share designs we're working on, post links to sites that we want to discuss, and chat about all sorts of things to keep a close connection between our different offices. But, one of the things that I love the most about our Campfire chatter is how we lean on each other for help with technical questions. A Photoshop question popped up the other day about whether there is a shortcut to group layers and automatically open the Group Properties dialog to name the new group. Seems simple enough, right? Wrong. Keyboard shortcuts only work with one command at a time. So, grouping layers (Cmd+G or Ctrl+G) and opening group properties (Cmd+R or Ctrl+R) work fine individually, but it breaks down when you want to do both with a single keystroke. Luckily we have Actions, which work brilliantly in this situation. Assuming that you have at least a basic knowledge of creating actions in Photoshop, I'm going to jump right to the good stuff (go here for more information on creating actions). Once you're recording, create a new layer group by clicking the folder icon at the bottom of the layers palette. There's no need to select any layers to group since Photoshop doesn't care what you're grouping; it's just needs to know that you want to create a group. This means that the action is general enough to be used for grouping anything together — layers with layers, layers with layer groups, etc. Now for the second step, which gets into some of the more hidden power of actions. 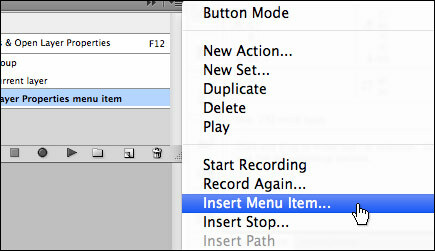 Click on the dropdown in the upper right corner of the Actions palette and select Insert Menu Item. This will open a prompt that asks you to select a menu item. Go to the Layer menu and select Group Properties. Whichever name you enter here will be used anytime you run the action to create a new group, so you may want to just leave the name as Untitled. Hit OK.
You can now stop recording the action ... You're done! This is a simple example of what can be done with actions, but it shows how you can streamline your workflow by condensing some repetitive tasks into a single keystroke. The action is currently set up to work with F12, but you can change this by clicking on the action, selecting Action Options... under the flyout menu, and modifying the Function Key. Bonus Tip: If you saw Dan Mall's tip about using bullets at the beginning of your layer group names, this is a perfect way to streamline that process, too. I didn't include it in the action provided, but you can add it by simply expanding the action, double-clicking Select Layer Properties menu item, and adding the bullet to the group name. To install this action: extract the zip file, go to the flyout menu in the Actions panel and select Load Actions..., and select the Grouping.atn file from your hard drive.